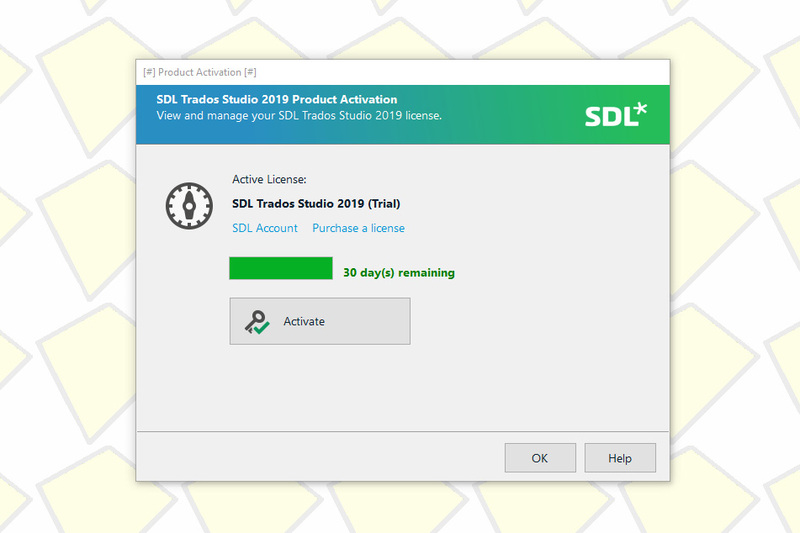 Time and time again, SDL offers a public beta of its Trados Studio suite to translators so they can test the software and share their feedback. This feedback is used to tweak the software, fix bugs and introduce some minor improvements to the user interface and under the hood. Like in the past I joined the group of beta testers to give Trados Studio 2019 a try and gather my input for this review. 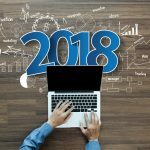 This Trados Studio 2019 review indeed is one in a review tradition: earlier I shared reviews of Trados Studio 2017 (which was released in 2016) and Trados Studio 2015 (2015). 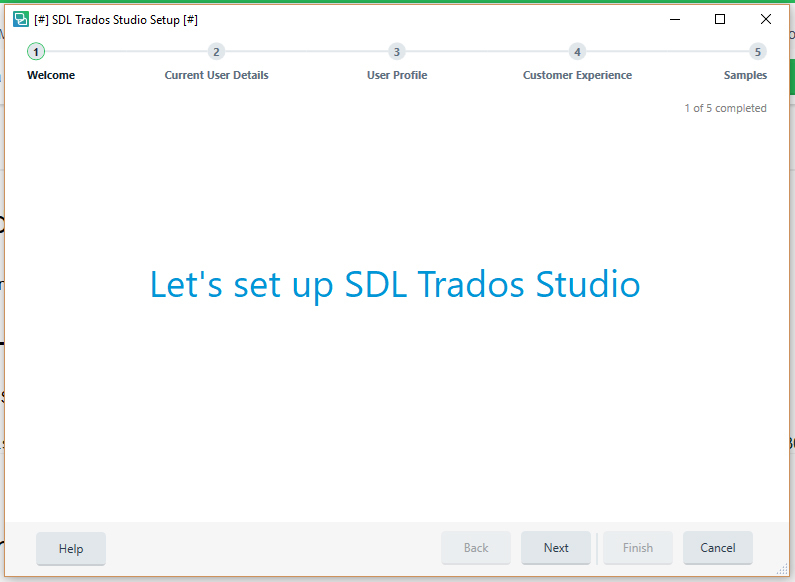 SDL mainly uses the number of the upcoming year in its Studio naming policy, so Trados Studio 2019 is supposed to be up to date for at least the upcoming year and a half. There is, however, not much consistency in the release dates of the translation software: earlier versions for 2014, 2011 and 2009 were introduced and it seems that a new Studio version is introduced simply when the company feels it needs to. In contrast to earlier versions, the introduction of Trados Studio 2019 seems to have happened largely in silence. Of course SDL announced the upcoming release, together with some online marketing campaigns. However, there were no striking marketing slogans or attempts to create buzz around ground-breaking technologies and other innovative features. The reason behind that? Trados Studio 2019 does not contain any. While the software does a good job of helping translators to improve their productivity, it lacks any thrilling features. Everything seems to revolve around speeding things up and making things easier. What is new in Trados Studio 2019? 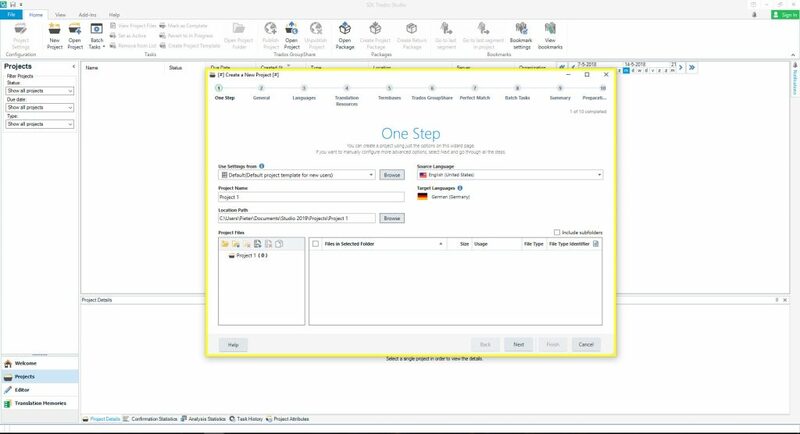 When SDL introduced the landing page with new features in Trados Studio 2019 I was a bit embarrassed: there was nothing like Adaptive MT, fragment recall or UpLIFT, which were introduced in Studio 2017 and really made sense. The highlighted features: get started with SDL Trados Studio in minutes, access powerful features up to four times quicker, create projects up to 28% faster than before and gain a new level of quality assurance. Nice, but a bit disappointing in a market where CAT tools are growing closer with every release and new technologies should be introduced in order to stand out. I was therefore very eager to download Trados Studio 2019 and test it out. Would it absolutely not offer anything more than these time gains? Or would it still contain some hidden gems? After having downloaded and tested Trados Studio 2019 I installed it in a sandbox environment. This was not without reason, as previous Trados Studio betas caused considerable trouble after removing the packages from my computer. 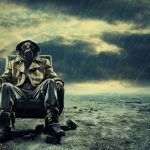 Now the sandboxed CAT tool offered availability although not for too long: licensing the beta versions has become a real horror so I had to stop early testing of the new Trados Studio 2019. It was too short a time to explore all the new features in depth, but long enough to draw a sound conclusion: Trados Studio 2019 does not contain any hidden gems whatsoever. Too bad. 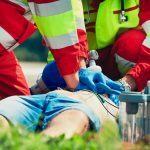 While the development team at SDL put their energy into tweaking the software to make it faster, for translators the most notable improvements are in the user interface. (Not a surprise as this is the environment they are looking at for hours every day.) The most important improvements are, without doubt, the new wizards. After installing the software users can follow a setup wizard which in five steps configures the most important aspects of the CAT tool. The second and even more important wizard is the ‘Create a New Project’ wizard. Although this is a long wizard, with 10 steps, it offers clarity and orderliness when users create a new translation project. 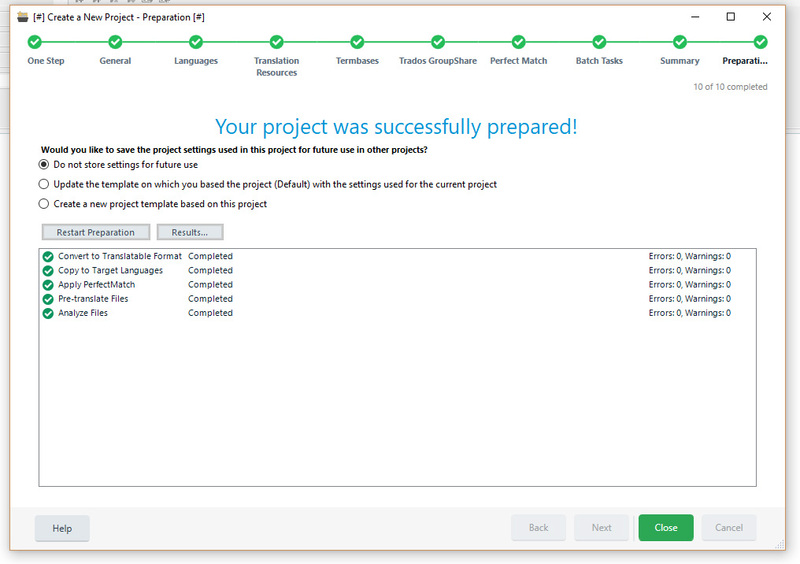 The wizard is, to a great extent, the same as the wizards in older versions of Trados Studio, but the flat design and clear steps really contribute to a better project management. While the user interface of Trados Studio 2019, like many of its predecessors, is quite straightforward (to which the introduction of the ribbon made a great contribution), users sometimes still struggle to find a quick answer on a pressing question. 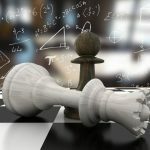 The developers at SDL therefore introduced the Tell Me function, which offers quick access to a straightforward answer and dozens of help articles. The feature was copied from MS Office 2016 (it even has the same shortcut as Office 2016, but that only makes it easier to use). The feature is more than a look-up feature only, as it offers suggestions on context as well. Depending on the search query, Tell Me offers quick access to the right functionality as well, so you can easily open certain features without many clicks by using the Tell Me feature. Another great improvement is the ‘Add File’ feature on the ribbon. For translators working on continuous projects or receiving new batches for existing projects, there is no need to dive deeply into the Trados Studio interface to add them. Instead they can use the ‘Add File’ icon on the ribbon to add files. 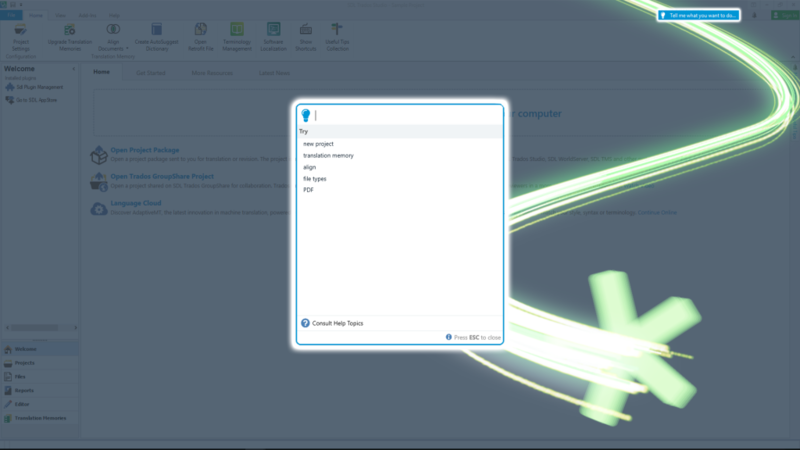 This feature is even more extensive as it offers options to run (custom) batch tasks or to add files as reference files only. In the past, Trados Studio lacked an option to import updated versions of a source file. If a client sent a new version of a file, translators had to stop their task and import a new file. In the case of larger tasks this required pre-translating the new file, and editing or translating changed and newly added segments. Trados Studio 2019 now contains an ‘Update File’ option, which enables you to import a new version of a file in seconds. Kilgray’s MemoQ has contained this feature for years now, but it is finally here in Trados Studio. Apart from these most notable improvements, there were several other tweaks and improvements added in Trados Studio 2019. Some of them are a bit hidden, but avid users of Trados Studio 2019 will stumble upon them quickly. Sometimes the improvements are really small, but nevertheless very useful. When verifying files for instance, the report will now show the segment number (also available in MemoQ for years), that enables users to reach their destination quickly. Users translating MS Visio files do not need to install a separate file type any longer as the file type is natively supported. On the other hand, this extension is only one of a few file types. For some file types Trados Studio still needs to go a long way to offer full support. Emma Goldsmith wrote a nice overview of small but useful improvements in Trados Studio 2019 on her blog here. For many translators improving their productivity is one of the most important aspects of investing in a CAT tool. 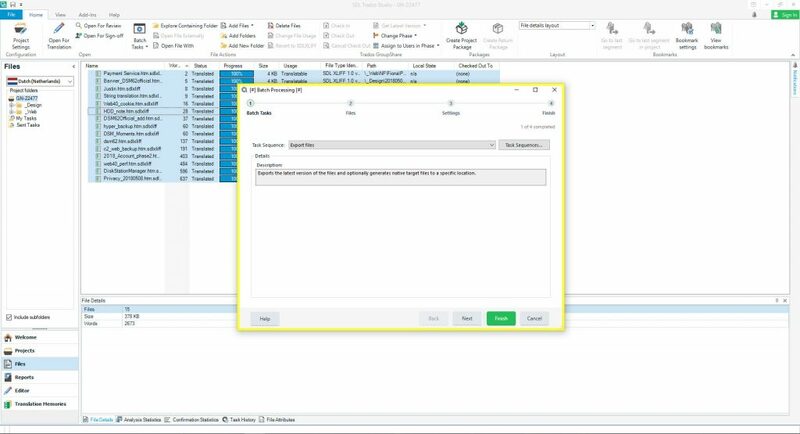 Buying a CAT tool will for sure offer a productivity improvement, and Trados Studio 2019 is lowering the barrier for quicker productivity gains. The promised speed improvement for quicker access (using the Tell Me feature) certainly makes sense, but gaining a speed improvement of 28% in starting new projects is immeasurable. It must be noted that these speeds are dependant on networks and computer resources as well. While Trados Studio 2019 seems a little bit faster than previous versions, it still depends on CPU performance and network access. And for people already being productive to the max the improvement in productivity is always less than for people using CAT tools for the first time. That brings us to the most important question: is Trados Studio 2019 worth the money? Yes and no. For people who have never invested in CAT tools Trados Studio 2019 offers a great tool with a flat learning curve and fast access to the most important features. For people who had already bought a previous version, the answer is much more nuanced. 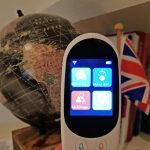 While the new features are interesting and nice to use, the question remains as to how much they will be used in a translator’s daily life. It might be useful then to wait before spending €225 for an upgrade (or €385, depending on the version you have already). Perhaps SDL will introduce more advanced technology in the future, which makes it an easier choice to buy a new version of Trados Studio.